As new parents, we find ourselves doing what most new parents do, which is filling time between diaper changes and feedings every two hours with fretting about whether we are doing right by our baby. Did we get the right high chair? Are we using the right bottles, pacifiers and baby wipes? The list of baby-related minutia is long, and there is seemingly no shortage of topics for new parents to worry about – no matter how seemingly inconsequential. One decision that weighed on us was transportation. 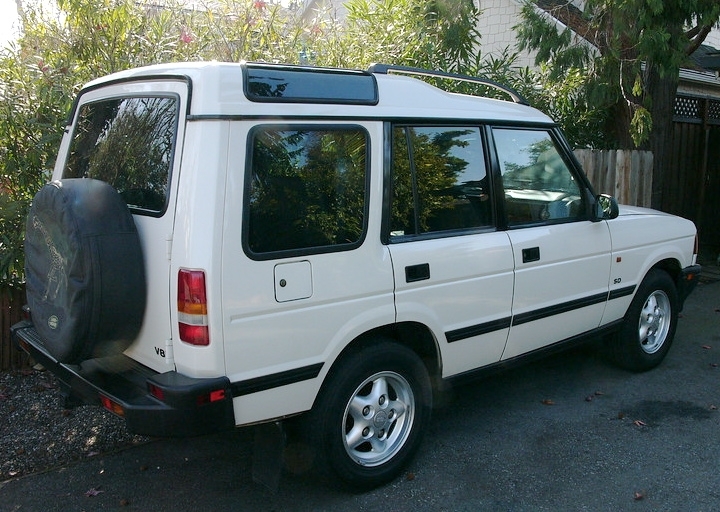 Our default baby hauler was a 1999 Land Rover Discovery (the last of Series 1, for the aficionados) that my wife bought secondhand as her first real car after landing her first post-law school job. With 170,000 miles on it, “Landyâ€ as we affectionately called her, took several tries to start in the morning (a leaking fuel pump proved to be the culprit) and made awful grinding noises when braking (pads had obviously worn down to bare metal ). On a normal car, this might be a few hundred dollars of repairs and we’d be back on the road. On a Land Rover, the brake rotors sit inboard of the hub assembly and require the hub and wheel bearings to be removed – to the tune of $900 per axle. Add to that a high parts price and oil change and we were looking at a $3,000 repair bill for a car that had a blue book value of $1,500 to $2,500 dollars. Yikes. Although Landy had served us well over the years, and probably had a lot of miles left in her, we knew that we could be driving a newer car that would handily beat her combined 14 mpg (on a good day, we would be lucky to see 10-12 mpg with her worn engine), didn’t require premium gas and had better active and passive safety for our baby – let alone the peace of mind of not wanting to be stuck at the side of the road with an infant should something go wrong. Under Obama’s Cash for Clunkers program, we knew that if we could find a replacement vehicle we liked that returned 10 mpg or more than Landy (24 mpg) we would qualify for the full $4,500 credit – around double her blue book value. For a car that got between 4 and 9 mpg or better, we’d still come out ahead with a $3,500 credit. 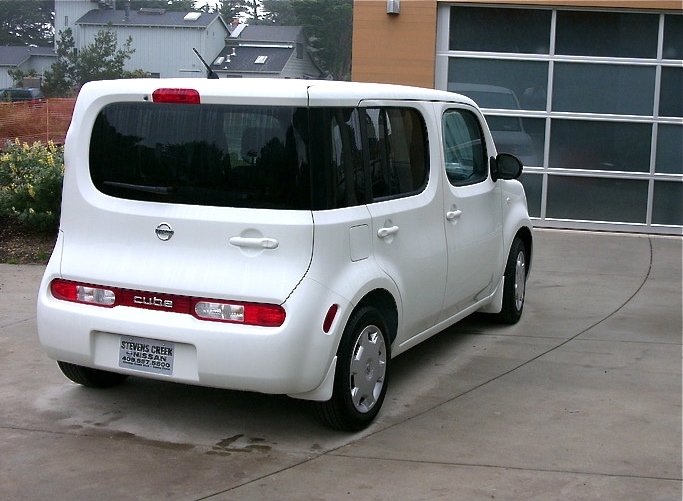 Once we had settled on trading in our trusty but geriatric Land Rover for a new Nissan Cube, I learned that Chrysler started a program that would sweeten the deal for consumers willing to consider a Chrysler/Dodge/Jeep as a replacement vehicle in a Cash for Clunkers swap. In essence, they would double the $4,500 on select models. After a quick scan of the criteria, I found that for around the same price as the Cube we had planned to buy, we could pick up a 2WD Jeep Patriot for $17,000 – and then using Chrysler’s matching funds, deduct $9,000 (more than half the price of the new car) off the transaction. We’d be driving home in a new Jeep for around $9,000 after taxes and fees. Still, the Patriot had its weaknesses. For starters, it didn’t have the Japanese anime looks of the Cube, and its fuel mileage was 5 mpg worse. Further, after talking to former Jeep owners, we had serious concerns about its resale value, long-term reliability and the fact that this model in particular looked and felt like a rental car (something that was certainly not the case with the Cube). Factor in “marginalâ€ side impact crash performance when not upgraded with optional safety equipment, and even discounted by half we couldn’t make the switch to the Jeep. If we needed 4WD and lived in the Snowbelt, it might have been different, but for what we wanted in a baby hauler, the Cube checked all the right boxes. Because babies are not cheap, and only get more expensive the longer you keep them, our goal was to drive off in something that we could write a check for and not take on a car payment. With the Cube/Jeep issue sorted, after looking at the numbers, we realized the Cash for Clunkers program did in fact make financial sense for us. Landy sold new to its original owner for $29,900 in 1999. 30,000 miles later, he sold it to my wife for $14,000, taking a nearly $16,000 depreciation hit – Landy lost nearly $2 a mile while he owned it. We proceeded to drive it for another 140K miles and got $4,500 under the program when we turned it in at 170K, so our cost to own was roughly $0.06 a mile. â€¨â€¨If we got our new Cube for $10,000 out the door (including all taxes and fees) and paid cash (so there is no car payment/associated financing) we could then drive the Cube for 100,000 miles and, even if it is worth absolutely nothing at that point, we'll still come in at about $0.10 a mile. This doesn't even take into account the dramatically reduced cost of fuel, maintenance, and other operating expenses in favor of the new car. The program is fairly lenient about what can be removed from a car and still have it be eligible, so we stripped Landy of some floor mats, cargo accessories and a trailer hitch and made the trip to the dealership with the requisite proof of having owned and insured her continuously for a year in hand, as well as a copy of the pink slip. As an aside, I couldn’t find anywhere in the rules that it has to have seats, doors, glass or anything other than a bare chassis and enough of an engine to limp into a dealership. I'd love to see someone limp in on three wheels, spewing exhaust right out of the header, sitting on a paint bucket, and throw them the keys. Once everything was said and done, we found the perfect Cube with a sticker price of $15,000, negotiated this down to $14,000, applied the credit and drove off in our new Cube for just a hair over $10K including tax, license and fees. The new Cube is everything we had hoped and more. We love the style, the clever use of space, the safety and the bevy of features missing from Landy. Finally, a proper stereo with a CD player and iPod connectivity instead of a 1980's tape deck and the same worn out Cyndi Lauper and Duran Duran tapes. There was a minor incident at the dealership, however. 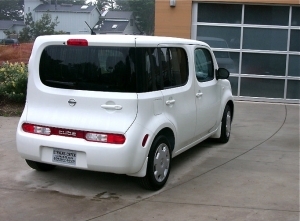 Although we bought our Cube on a Saturday, it was held at the dealership through Tuesday (along with 50 other cars that were purchased with Cash for Clunkers trades over the weekend at that location) while the dealership franchise muddled through program negotiations with the federal government. It was our understanding that their refusal to release cars to customers was not unique to the dealership we bought ours from, but carried over to their entire dealer network. While it is obvious that it would be untenable to make all three options available to all owners, if the program were a bit more robust and more carefully screened, they could at least cherry-pick a subset of vehicles that could be repurposed for use either here or abroad. â€¨â€¨This would make owners feel better about having some hand in determining the fate of their vehicles, still serves the primary objective of kick-starting the economy because the same number of new vehicles are being sold, but could also add additional value to taxpayers by minimizing the amount of cash assistance we are currently providing both here and abroad while providing a trade/training program to help put people back to work in the service industry.